Are your home’s windows drafty and difficult to open or close? Are you paying more every year to heat and cool your home? Do your windows only have a single pane of glass protecting you from the outside world? It is time to upgrade the look of your home with energy-efficient Houston replacement windows from Live Oak Construction. Older windows that are poorly designed, constructed, and installed allow energy to pass through easily, reducing efficiency and increasing your monthly bills. At a time when the cost of electricity, gas and heating oil are climbing higher than ever, can you afford to let so much money simply fly out the window? 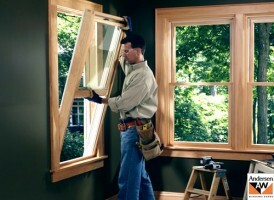 One call to Live Oak Construction’s Houston replacement window experts and you can be on the road replacing your drafty old windows with modern Houston replacement windows that have been engineered for maximum thermal efficiency, and deliver added convenience and style as well. Our replacement windows are custom-sized to fit your home perfectly, with no gaps to allow energy to escape or outside air to infiltrate. They are EnergyStar™ rated to deliver excellent thermal performance to keep you cooler all summer and warmer all winter. Call Live Oak Construction today at 713-991-2667 to schedule a FREE in-home consultation and estimate for your Houston replacement windows.